Anurag Kashyap enters Romantic- Comedy battleground! Story: A story from streets of Amritsar, Punjab; the tale of two young lovers turns out to be more complicated as the question of marriage arises, the package of responsibilities is bound to appear as the bond between the two starts expanding. Rumi a young girl who runs a small sports equipment shop falls in love with Vicky who seems to be an upcoming rapper and a DJ. While the two indulge themselves in the youthful desires, the couple is cracked apart by the common social institution known as 'Marriage'! Review: While the modern Indian society runs amidst the cultural issues of love or arranges marriage, the question returns back to the changing definition of love amongst millennials. With the globalization penetrated through even the remote places of India, the so-called concept of modernity has crept the society gradually. The director Anurag Kashyap who is known for his Indie, crime action, and thriller films has now ventured into the genre of romantic comedy. The director outshines as he has his own style of working and when Anurag Kashyap turns-up for a directorial, symbolism is undoubtedly to be a part of the film. While Anurag's films are hand-stitched with perfection it traverses through those 3 hours of awesomeness. The budding actor and a self-made star Vicky Kaushal never ceases to amaze his fans. As the actor made his debut in Masaan, he has been versatile throughout his appearance and the performance so far. At first, it is quite discerning as we go through a glimpse of Vicky Kaushal for the character he played in the film. The actor seems to pull up his socks for every character he tries to portray on the big screen. He has been doing very well so far, and what else does audience want when you get a classy package of performance? As Gandhi quotes, "Simplicity is the essence of universality." The costume designer Prashant Sawant nailed the simplicity part very well, while Tapsee is seen wearing traditional attire, i.e. a Punjabi dress, the simplicity itself outshines other outfits. The undivided attention towards each and every detail has been outdrawn very well! Abhishek Bachan! Well the name itself has significance to it. The actor last appeared in houseful 3 but couldn't get much of applause from his fans! But, Abhishek has done a good job portraying the character of Robbie who is stuck between the couple! However, it's difficult to it would take more than just 1 movie to clear away so many years of backlog. Moreover, the film has quite a number of symbolism which the audience can speculate with an endless number of theories! Overall, it's a great experience to watch the mind-bending rollercoaster of emotions but, the film tends to be extremely lengthy which needed to be filtered more! 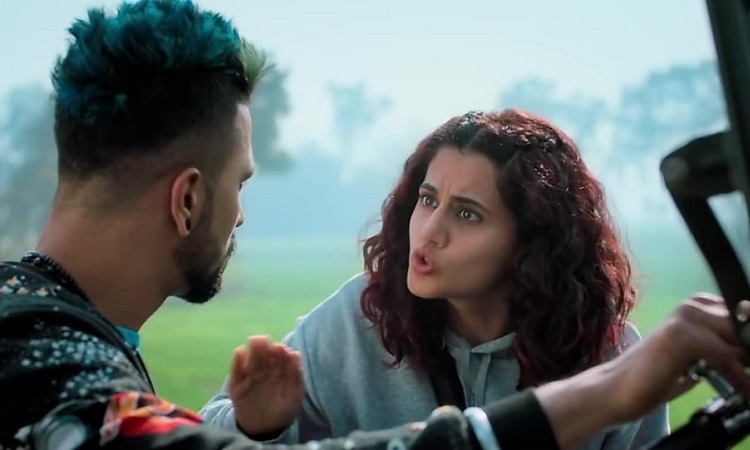 The film had exceptional camera angles which made it more heart-warming, but it is a film that simply tries to convey the problems of an unhealthy relationship. What more can be done? However, the director has done a wonderful job of keeping the audience entertained, but when it comes to Anurag things tend to get tacky. The film duration overall is 157 minutes and when you imagine you had to go through the love-triangle story it turns out to be the Bermuda triangle for the audience. No matter how well you picture your film, no matter how you exemplify others it could have been a bit short!